The game of 2048 is a free app for iPhones and Android phones. When you begin a game, you see a 4-by-4 array of square tiles. A few tiles have numbers on them—always 2s and 4s—but most of the tiles are blank. The goal of the game is to get a tile with the number 2048 on it. You play by sliding a finger up, down, or across a column or row on the game board. When you swipe so that two tiles with 2s on them touch, the two 2s disappear and are replaced with a 4 on one of the tiles. And if you swipe so that two 4s touch, you get an 8. Two 8s make a 16, two 16s make a 32, and so on. Doubling in this way, you can work your way up―2, 4, 8, 16, 32, 64, 128, 256, 512, 1024, and, finally, 2048. When the grid becomes completely full with numbers on all tiles and no two adjacent tiles have the same number, the game automatically ends. I found the game easy to play but also vexing. Two weeks after her first email, Sandra wrote in another message, “Made it!” And she attached a screenshot of her completed game showing the 2048 tile. (See the photo at the beginning of this post.) By the time I received Sandra’s victory message, the greatest number I had managed to produce was 512. The next week I talked with Charlotte again about the game. She told me that she was able to get a tile with 2048 on it fairly regularly. I asked for tips about how to swipe, and she gave me simple, clear, and effective advice, demonstrating on my phone. I followed her advice and now have gotten to 2048 several times. Once you reach 2048, you have the option of continuing to play and trying to get to 4096 and beyond. I haven’t had any success with that. Yet. 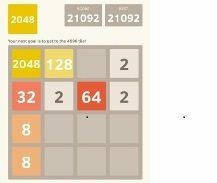 So, how did the game of 2048 help me think more about teaching math and my ongoing quest to improve my classroom teaching practices? I think that playing 2048 is a learning challenge that embodies the qualities I strive for in math instruction. The game presents a problem situation to investigate―to get to 2048. It’s accessible to a wide range of abilities―getting started is easy. It allows for differentiation―there are different levels and ways to engage. (And a 5-by-5 version of the game, 2048 Extreme—also available as a free app—makes it easier to be successful and was more fun for Jeffrey). The game encourages looking for regularity and structure―you strive to figure out how to make more effective swipes. It provides the opportunity to make and test conjectures―you have many opportunities to test your ideas about making more effective moves. is appropriate both for individual exploration and group collaboration. P.S. Friends have told me that the game of 2048 is based on the game of Threes, another to try. I haven’t yet. I don’t need one more addiction right now. My granddaughter Charlotte made the assumption that I already knew about the game of 2048 because it was a math game. And while it’s true that the game involves numbers, it’s also mathematically interesting because it embodies important mathematical practices—making sense of a problem and persevering to solve it, and looking for and making use of structure. At first I didn’t think of the game for classroom instruction, but on reflecting I think it would be worthy as an investigation itself and also as a springboard for talking about the doubling pattern that leads to powers of two. What would we still like to know? Ask them to write statements in both categories. To manage sharing of ideas with the entire class, either give them sentence strips that you can post or have them record on chart paper. For ideas on engaging students with the powers of two (and more), read the lesson that Maryann Wickett and I included in our book Teaching Arithmetic: Lessons for Extending Place Value, Grade 3 . The lesson, based on the children’s book The 512 Ants on Sullivan Street, written by Carol A. Losi with teaching suggestions that I wrote included at the end, is available as a PDF on the Math Solutions site. Information about other classroom lessons using this children’s book can be found in Math and Literature, Grades 2–3 and Math and Literature, Grades 6–8.